Lineage. Constituted 19 Observation Squadron (Light) on 5 Feb 1942. Activated on 2 Mar 1942. Redesignated: 19 Observation Squadron on 4 Jul 1942; 19 Liaison Squadron on 2 Apr 1943. Inactivated on 1 Dec 1945. Redesignated 19 Tactical Air Support Squadron (Light), and activated, on 17 Jun 1963. Organized on 8 Jul 1963. Discontinued, and inactivated, on 8 Aug 1964. Activated on 16 Oct 1964. Organized on 21 Oct 1964. Inactivated on 1 Oct 1993. Redesignated 19 Weapons Squadron on 24 Jan 2003. Activated on 3 Feb 2003. Assignments. Air Force Combat Command, 2 Mar 1942; Army Air Forces, 9 Mar 1942; 66 Observation (later, 66 Reconnaissance) Group, 29 Mar 1942; I Air Support Command (later, I Tactical Air Division), 11 Aug 1943; U. S. Army Forces, China-Burma-India, Apr 1944; Fourteenth Air Force. 29 May 1944 (attached to Y Force, 29 May 1944-); 69 Composite Wing, 10 Jun 1944 (remained attached to Y Force to 8 Aug 1944); Tenth Air Force, 1 Aug-1 Dec 1945. 34 Tactical Group, 8 Jul 1963-8 Aug 1964. 34 Tactical Group, 21 Oct 1964; 6251 Tactical Fighter Wing, 8 Jul 1965 (attached to 6250 Tactical Air Support Group, Provisional, 1 Aug-8 Nov 1965); 505 Tactical Control Group, 8 Nov 1965 (attached to Tactical Air Support Group, Provisional, 6253, 9 Sep-8 Dec 1966); 504 Tactical Air Support Group, 8 Dec 1966; 314 Air Division, 15 Jan 1972; 51 Composite Wing, 30 Sep 1974; 5 Tactical Air Control Group, 8 Jan 1980; 51 Fighter (later, 51 Operations) Group, 1 Oct 1990-1 Oct 1993. USAF Weapons School, 3 Feb 2003-. Components. Detachment: 1 (Camp Casey, South Korea): 15 Apr 1976-8 Jan 1980. Stations. Miami Muni Aprt, FL, 2 Mar 1942; Jacksonville Muni Aprt, FL, 7 Mar 1942; Pope Field, NC, 11 May 1942; Morris Field, NC, 19 Oct 1942; Camp Campbell (later, Campbell AAFld), KY, 3 Apr 1943; Aiken AAFld, SC, 22 Jun 1943-26 Feb 1944; Bombay, India, 9 Apr 1944; Kanchrapara, India, c. 15 Apr 1944; Ondal, India, 29 Apr 1944; Chabua, India, 17 May 1944; Kunming, China, 29 May 1944; Chengkung, China, 28 Mar 1945; Nanning, China, 18 Aug 1945; Calcutta, India, c. Oct-7 Nov 1945; Fort Lewis, WA, 30 Nov-1 Dec 1945. Bien Hoa AB, South Vietnam, 8 Jul 1963-8 Aug 1964. Bien Hoa AB, South Vietnam, 21 Oct 1964; Phan Rang AB, South Vietnam, 1 Aug 1971; Osan AB, South Korea, 15 Jan 1972; Suwon AB, South Korea, 1 Aug 1989; Osan AB, South Korea, 1 Oct 1990-1 Oct 1993. Nellis AFB, NV, 3 Feb 2003-. Aircraft. A-20, 1942-1943; B-25, 1942-1943; DB-7, 1942-1943; L-1, 1942-1943, 1944-1945; L-4, 1942-1943, 1943-1944; O-46, 1942-1943; O-52, 1942; P-39, 1942-1943; P-43, 1942-1943; L-2, 1943, 1943-1944; L-3, 1943; L-5, 1943, 1943-1945; L-6, 1943; 1943-1944; P-51, 1943. O-1, 1963-1964. O-1, 1964-1970, 1971; O-2, 1968-1971, 1972-1975; OV-10, 1968-1971, 1975-1983, 1985-c. 1989; OA-37, 1983-1985; A(later OA)-10, 1989-1993. Operations. Antisubmarine patrols, Mar-c. Oct 1942; combat in CBI, Jun 1944-Aug 1945. Combat in Southeast Asia, Jul 1963-Aug 1964 and Oct 1964-Sep 1971. Provided close air and aerial reconnaissance support, supporting the Eighth U.S. Army and Republic of Korea ground forces, Jan 1972-c. 1980; operated the forward air control mission within the Korean tactical air control system, 1980-1 Oct 1993. Campaign Streamers. World War II: Antisubmarine, American Theater; India-Burma; China Defensive; Central Burma; China Offensive. Vietnam: Vietnam Advisory; Vietnam Defensive; Vietnam Air; Vietnam Air Offensive; Vietnam Air Offensive, Phase II; Vietnam Air Offensive, Phase III; Vietnam Air/Ground; Vietnam Air Offensive, Phase IV; TET 69/Counteroffensive; Vietnam Summer-Fall 1969; Vietnam Winter-Spring 1970; Sanctuary Counteroffensive; Southwest Monsoon; Commando Hunt V; Command Hunt VI. Decorations. Presidential Unit Citations (Southeast Asia): 1 Aug 1968-31 Aug 1969; 1 Jan-31 Dec 1970; 30 Jan-30 Sep 1971. Air Force Outstanding Unit Awards with the Combat “V” Device: 1 May 1963-31 Jul 1964; 1 Jul 1965-15 May 1966; 1 Jul 1966-31 May 1967; 1 May 1969-30 Apr 1970. Air Force Outstanding Unit Awards: 30 Sep 1974-31 Mar 1976; 1 Jul 1982-30 Jun 1984; 1 Jul 1984-30 Apr 1986; 1 Dec 1986-2 Oct 1988; 3 Oct 1988-30 Sep 1990; 1 Oct 1992-[1 Oct 1993]. Republic of Vietnam Gallantry Cross with Palm: 1 Apr 1966-[30 Sep 1971]. Republic of Korea Presidential Unit Citation: 19-20 Aug 1972. Emblem. Approved on 11 Oct 1943. 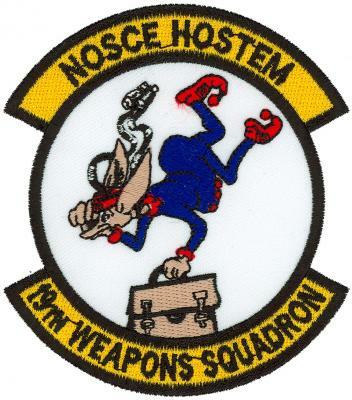 Squadron apparently has used several unofficial emblems at various times, but never carried through with the approval process.